It is hard to imagine that the field of astronomy would have made much headway if telescopes had never been invented, or that cell biology would have advanced far without microscopes. Even though the most powerful tool in any scientific endeavor is a curious mind, the application of technology helps too. Those techniques do not always have to be sophisticated or expensive. In a marvelous example of understatement, Sanjo Rose and Dieter Oschadleus of the University of Cape Town in South Africa recently wrote: “Bird ringing provides novel insights into the private lives of birds.” Let me be a little less restrained; without the application of numbered bands to the legs of millions of wild birds, much of the lives of birds would still be a mystery to us. Bird ringing, known is some parts of the world as bird banding, and the subsequent recapture of some of those banded individuals, allows us to learn about where, when and how they live their lives. Ringed on its breeding territory, a bird might be recaptured on its wintering grounds, providing us with a link between the two regions. If a combination of coloured legs bands are used for individual identification, we can sometimes follow a bird as it interacts with its environment and other birds around it. It is almost certain that some readers of this column will be engaged in bird ringing as a hobby. I have met hobbyists that have ringed tens of thousands of birds. I have ringed a far smaller number of birds for research purposes. All of this activity contributes to a better understanding of the avian world. 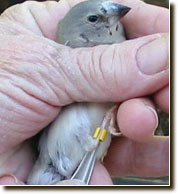 In southern Africa, the activities of bird ringers is coordinated by the South African Bird Ringing scheme. Since 1948, more than 2.3 million birds have had numbered rings applied to their legs. In a recent publication, Rose and Oschadleus reported on their efforts to learn about the longevity of estrildids, or waxbill finches, based on the banding and recovery of birds in southern Africa. Old World birds, estrildids can be found over large parts of Africa, southern Asia and Australasia. Within the group’s 130 species, some will be very familiar to fanciers of cage birds. These include the Australian Zebra Finch, Java Sparrow and Gouldian Finch. Rose and Oschadeleus found that more than 150,000 estrildids have been banded in southern Africa. Five species were represented by more than 10,000 ringing records each, including the Blue Waxbill and the Red-headed Finch. Many of those ringed birds have been recovered. Other species, including the Cinderella Waxbill and the Locust Finch have been ringed fewer than one hundred times, and none have been seen subsequently. Longevity is a crucial demographic if we are to understand the population dynamics of species, and so Rose and Oschadleus reported those figures for southern African birds with the largest datasets. They found, for instance, that 27,813 Red-headed Finches had been marked, and that the oldest individual had been at least 5.2 years of age. More than twenty-thousand Bronze Manakins had received rings, but the oldest had been only 3.7 years of age. The record holder was a Blue Waxbill, one of 28,037 ringed. It had first been banded on June 25, 1996 and recovered on February 21, 2009. By my calculations, this bird’s minimum age was twelve years, seven months and twenty-eight days. If you are involved in bird ringing, well done! You are contributing to a better understanding of birds. If you are looking for a new hobby, perhaps you will consider contacting the wild bird enthusiasts’ group in your area to find out how you could become part of the program. Rose, S. and H. D. Oschadleus. 2018. Longevity summary from 69 years of Estrildidae ringing data in southern Africa. African Zoology 53:41-46. Photo credits: banding a Gouldian Finch fledgeling - https://ladygouldianfinch.com/features_banding.php; Cinderella Waxbill stamp - colnect.com.